The Phillies hit the road and will begin a 3-game series in Atlanta on Tuesday night. The 3-time defending National League East Division Champions from Philadelphia will get their first regular season look at the rookie with all the hype, Jason Heyward, who is batting .302 through his first 12 Major League games. Following a 7-1 start, the Phillies have lost three of their last four games, including their first series loss of the season, as they dropped 2 of 3 to the Marlins over the weekend. The Braves have a 7-5 record and are hoping to knock the champs down. Read on for details on the pitching match ups for this series and other key notes. Tuesday, 7:10pm. Kyle Kendrick (0-0, 17.47 ERA) vs. Tommy Hanson (1-1, 2.38 ERA). Kendrick's time in the Phillies' starting rotation could be in jeopardy as the man he is filling in for, Joe Blanton, work his way back from an oblique injury. Kendrick has pitched just 5 2/3 inning in two starts this season. In 7 career games against Atlanta, Kyle is 4-1 with a 3.29 ERA. Hanson has faced the Phillies twice and he is 0-2 with a 6.43 ERA and .321 batting average against in those outings. In 12 starts at Turner Field, Hanson has a 7-3 record with a 3.15 ERA. Wednesday, 7:10pm. Roy Halladay (3-0, 1.12 ERA) vs. Tim Hudson (1-0, 2.84 ERA). Halladay has allowed just 1 run in 10 1/3 innings against the Braves. Hudson is 4-6 with a 3.79 ERA in 15 career starts against the Phils. Ryan Howard is 12-for-34 (.353 avg) with 5 homers, 10 RBI and 7 walks against Hudson. In 64 career starts at Turner Field, Hudson has a 29-18 record with 3.56 ERA. Thursday, 7:10pm. Jamie Moyer (1-1, 7.50 ERA) vs. Derek Lowe (3-0, 4.67 ERA). In 5 starts at Turner Field, Moyer is 1-2 with a 5.46 ERA. Troy Glaus against Moyer is 19-for-54 (.352 avg) with 5 homers and 15 RBI. In 14 regular season games against the Phillies, Lowe is 6-1 with a 2.56 ERA. Last year in 17 starts at Turner Field, Lowe had a 6-4 record with a 4.28 ERA. Raul Ibanez is 2-for-25 (.080 avg) against Lowe...both hits are homers. 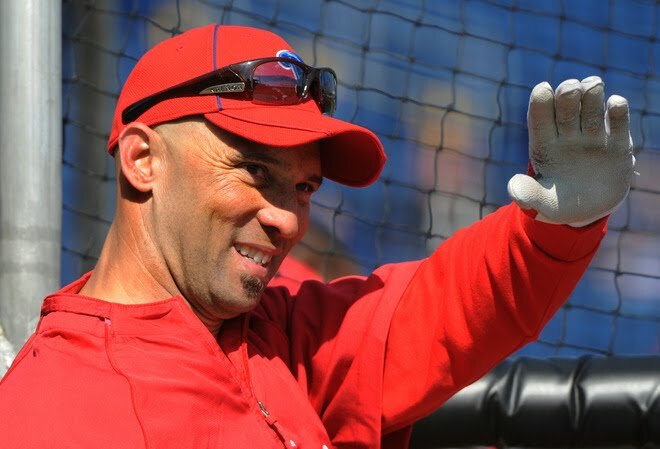 Ibanez along with Ryan Howard, Shane Victorino, Carlos Ruiz, Juan Castro, Brian Schneider and Jayson Werth are a combined 12-for-96 (.120 avg) against Lowe. Chipper Jones against Kendrick, Halladay & Moyer is 14-for-33 (.424 avg) with 4 homers and 10 RBI. Brian McCann hit 5 of his 21 homers last season off Phillies pitchers. McCann is a career .304 hitter in 72 games against the Phils. Ryan Howard has hit more homers (15) at Turner Field than any other road ballpark. In 42 games there, Howard is a .336 hitter and has a 1.129 OPS. In 25 career games at Turner Field, Ryan Madson is 4-1 with 2 blown saves and a 1.91 ERA. "Jay" Happ will miss a turn in the starting rotation, as he has been diagnosed with a strained flexor pronator muscle in his forearm. The team is taking a conservative approach with Happ, hoping he will return to action next week.